Originally, my intention was to write some final words about my time in Korea before I left. But my last few weeks ended up becoming almost overwhelmingly emotional and busy. There were last classes to plan, final dinners with so many friends, and gifts to give to other teachers. Every meal felt shorter and shorter. With every goodbye, from my students to my host family, the words I wanted to say clumped in my throat, the void between our English and Korean too vast to say what needed to be said. In truth, it was also hard to write a final entry because I wasn’t quite sure how to conclude this past year. After everything, it feels like it’s only right to provide some sort of reflection or summary about all of the things that I’ve learned and seen and done. In part, this is difficult to do in a practical sense because much of what I did this year was new to me. I came into Korea with scattered knowledge and interest in some parts of Korean history, a haphazard memorization of the Korean alphabet, and a desire to learn as much as I could about education and teaching. Every day was a flood of new information; the meals I ate, the vocabulary sheets I studied, the moments I struggled with a busy class, and the times I got to know the little quirks and stories of all the new people in my life. I learned how to live in a small town, how to say a lot with a few words, and how to navigate my own interests and efforts, and learn at my own pace. Truthfully, even with all of this, I am still figuring out how this past year will impact me in the future, especially in the context of returning to the United States and starting school again. This last week, I moved to Chicago, ready to start the next chapter of my life, medical school. It’s been nice to be surrounded by the familiar- the sunset on lake Michigan, the salty snacks, my family and friends, and the ease in communication. In many senses though, it feels as if I’ve gone as far away as I could from my last year. It’s not just the 14-hour time gap and 6,500 miles. I’ve left a small town for a city of almost 3 million people. I’ll go from teaching young children on a steady 9-5 schedule to falling into the hectic and scattered time table of being a student with other people close to my age. I’ll miss naengmyeon in the summer, full length outfits at the beach, and gigantic hot packs for the coldest winter days and stomach aches. I’ll really, really miss getting to see my host brother build gadgets out of random household objects, evenings chatting with my host family over fruit, sharing a smile with my co-teacher during the cutest moments in class, my students trying to mime impossibly convoluted stories to me, and the relief of unleashing the week’s events in English with friends on the weekends. But I’m excited as well, and I know I have a lot to look forward to. I’m eager to see the ways in which the things I learned and the people I met this last year stick with me as I go forward. I’m hopeful that these friendships will continue to grow. Mostly, I’m incredibly thankful to all of the people who extended their homes and time and support and love to me while in Korea, and for all the reasons I have to one day return. As I prepared to leave America last spring, I began to receive a lot of questions about my future plans in Korea. How would I learn the language? What age group would I be teaching? Was I nervous? What was the food like? But by and far the most common question I was asked was not about South Korea at all, but its neighbor to the north. Would I be safe, with everything happening with North Korea right now? It was a question I received over and over again. Of course, I anticipated some fixation on North Korea; it’s a country that has drifted in and out of discussion in mainstream American media, with coverage of its government and human rights violations, and tensions with South Korea. Accessing information about North Korea is simply a lot easier for most Americans. For instance, a few months before leaving for Korea, my dad and I visited a local Barnes and Noble in hopes of finding resources for this year. I scanned through the shelves, trying to keep track of my mental checklist for resources I would need next year, a few history books, a language book, maybe a travel guide? But as I went through the titles, I realized that I would probably not find what I was looking for. “A history of North Korea, North of the DMZ, Under the Same Sky: From Starvation in North Korea…” they went on, North Korea, North Korea, North Korea. Around the time I left especially, North Korea featured heavily in American news. There was the U.S. student who was returned to America in a coma after being held North Korea, only to pass away a few days later. There were missile tests, and threatening tweets. Tensions seemed to be escalating. At the time though, I wasn’t concerned. Everyone I knew who had experience with South Korea told me that it never seemed to impact day to day life. “Western media exaggerates the tension, most people in South Korea don’t even notice it in their daily lives.” I was interested in learning about North Korea, especially the refugee population in South Korea, and even hoped to volunteer at a North Korean defector center. * Besides that and my own personal interest however, I didn’t believe that I would have any reason to think about North Korea on a consistent basis. Then, in mid-July, I found out that my placement, Hwacheon, was a small, rural military town just 6 miles south of the DMZ. I had no reason to feel unsafe, and after talking to the previous ETA’s, I felt really excited to see my new placement. But at the same time, I suddenly wasn’t quite so sure what to expect. The first thing I noticed about Hwacheon was the scenery. The road into town twists and turns along the riverside, clinging against the side of the mountains. There are stretches of farmland that extend into the open, fields of yellow and green, and the actual town center is pressed up against a steep forested mountain face. The Bukhan river, which I cross over on my commute from the apartment to school, always glistens with reflections of the clouds and sky that loom above it. The bridge and city center are laced with purple flowers and roses along the railings and buildings. There is attention and detail in how the town cares for its surroundings. The second thing I noticed about Hwacheon were the soldiers. I had never lived in a place with a large military presence before, and in Hwacheon, with its already small population, the green uniforms were quite visible. ** The town center was filled with them during the day, directing traffic, walking to work, performing drills by the river. On the weekends, during their breaks, many soldiers fill up the local cafes and restaurants with their visiting girlfriends and friends. The bus lines home on Sunday evenings would often ebb and flow with the number of soldiers who needed to return home before curfew. One Monday morning, as my host mom was dropping us off at school, I glanced out the window, only to find that we were driving side by side with a small tank of soldiers, also on their way to work. Initially a bewildering sight, gradually, I became desensitized to these encounters, even comfortable in this setting. South Korea has a mandatory military service for male citizens (although women can voluntarily enlist). The service lasts for two years and can be taken up at any time between age 18 and 35. Many young men end up taking the service either before or during their college years to avoid disrupting their career. Thus, many of the soldiers in Hwacheon actually seem quite young. I may see them running drills or on duty during the day, but then on bus rides home I’ll see them taking long goodbyes with their girlfriends or scrolling through manga on their phones. I think of some of my eager and wandering male students, the ones who get distracted or are extra sweet to their friends and try to wrap my mind around the fact that some of them will be in uniform themselves in as little as six years. Living in a host family with a career soldier has also introduced me to a lot of what long term Korean military life is like. The schedule is busy and erratic, with long hours. At first, I found many of the older soldiers intimidating. During one of my first meetings with my host dad’s friends and families, I remember being uneasy for a little while, unsure of how to interact with everyone, until we discovered that we all liked tennis and started chatting about the U.S. Open and Rafael Nadal. Hwacheon’s civilian to soldier population divide is about half and half, and many of my students come from military families, with a parent in the army. In some ways, this extends the already small and close knit nature of the town, with so many families knowing each other through the schools, businesses, and military. While I anticipated adjusting to Hwacheon over time, I never imagined how safe I would actually end up feeling. The young soldiers have a relatively early curfew, and tend to stay on their side of town. As it gets later and later, the town usually ends up becoming blissfully empty, save for a few older people going on night time walks or riding their bikes along the riverside, or young students visiting PC bangs or going on runs. Moreover, the more time I’ve spent here, the more familiar faces I find as I venture outside. I run into neighbors on evening jogs, or meet a student’s parent while shopping at the grocery store. Over time, I’ve grown more and more comfortable with every evening stroll with my host mom and every spontaneous interaction, and I think that sense of ease and familiarity is something I will miss a lot when I return home. On my commutes to Hwacheon from other cities, I always pass a little stone a few miles south of the town with a little 38° mark indicating that we’ve passed the 38th parallel north. The Bukhan, North Han, river in my town actually flows upwards through the DMZ and into North Korea (Bukhan, 북한, also happens to be the name that South Korea uses to refer to North Korea). Gangwon-do, the province that I am in, is one of three on the peninsula that is “split” between the North and South. As generations go by, there’s a sense that these connections will be lost. The pain of families being broken apart, or the separation of the Korean nation seems deeper among older Koreans, some of whom may actually remember what it was like to be a single country. Younger generations are reportedly less enthusiastic about reunification, hesitant about the economic problems that could arise. That said, I think there are still many young Koreans invested and curious about North Korea. During Orientation, over a meal, a visiting high school student told me that, while she’s not sure how she would feel about the two Korea’s reuniting, she often wonders what it would be like to see famous places in North Korea. One of the other teachers in our program actually teaches at a missionary school that specially caters to North Korean defectors. There are also many South Korean students who attend this school, and often they have a special interest in reunification. At different points in the year, I know that the news cycles were a source of stress for a lot of ETA’s. At one point, a friend suggested drafting an email to send out to family in case anything were to go wrong, but I wasn’t sure what I could or should possibly write. The idea of Hwacheon being anything other than a small safe town in the mountains felt unfathomable, the idea of my friends and students here being in any danger too impossible to really feel. As winter began though, the news around the two Korea’s started to shift. 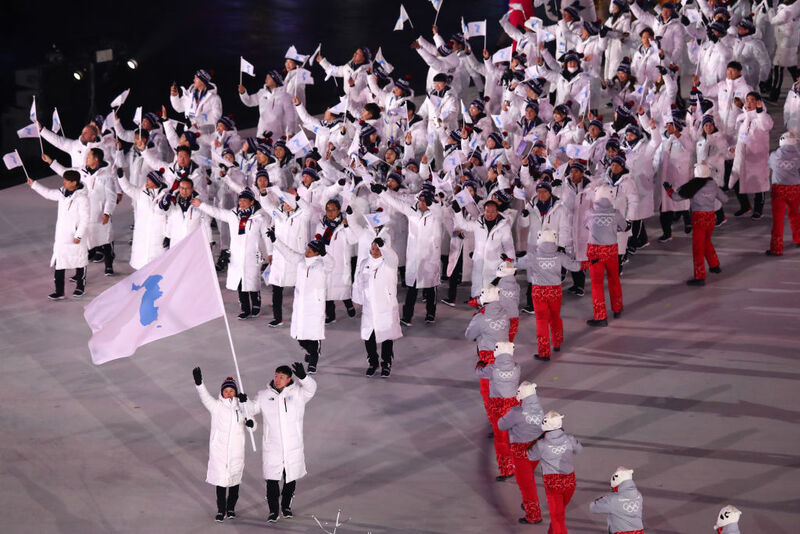 There was the united Korean team at the Pyeongchang Olympics, where spectators were eagerly handed the blue “united” flag. Most surprisingly and importantly, there was the Peace Summit in the spring. On April 27th, South Korea’s President Moon Jae-in of the Republic of Korea and North Korea’s Kim Jong Un met on the South Korean side of the Joint Security Area- the first time that a North Korean leader has come to the South since the war. While many elementary school students didn’t seem to pay too much attention to the event, at high schools, friends mentioned that the entire summit was streaming in classrooms and offices throughout the day. I heard my co-workers and host family mention it in passing, a wave of interest and energy. Many people weren’t sure whether they could trust North Korea, but expressed excitement nevertheless. Coincidentally, my friends and I had arranged a trip to the DMZ on the 28th of April, the day after the Peace Summit, before we had known the event would happen. Thus, we ended up on at the border on a fairly busy Saturday, onlookers discussing the events of the previous day as they passed the trains and monuments at the border. I want to emphasize that even steps away from the border in a military town, I had little to no reason to personally be concerned or worried about North Korea this entire year. I’ve still thought about it of course, in part because of what it might mean to the people in this town, whose lives and livelihoods are centered around their soldiers, or the young students I’ve taught who know that they will serve in the military when the grow older. But it’s also been an extraordinary year to be in Korea, in no small part because of the potential for change in the relationship between the North and South. I’m not sure what lies in the future for North and South Korea, but I will never forget seeing the paintings of Kumgang mountain***, the TV’s flooded with images of the two countries’ leaders shaking hands, the kids who wondered about what lies in the North, or the flurry of white and blue flags being waved around at the 2018 Olympics. *Many ETA’s are volunteer English teachers at Hana Centers, or North Korean defector centers, where support, assistance, and education is provided to help North Koreans as they try to integrate in South Korean society. Linguistic and cultural differences can visibly separate North and South Koreans, and contribute to stigma in South Korean society against these defectors. Additionally, many defectors face financial hardship and struggle with their mental health. There are actually not many Hana centers in my province, as many defectors feel uncomfortable living so close to North Korea. Instead, most North Koreans move to Seoul or Busan, or other larger Korean cities. **The exact statistics on Hwacheon’s population seem to vary, but it seems to sit around 20,000 people for civilians, to an additional 20-30,000 soldiers. (This appears to be for all of Hwacheon county, rather than just the town area). ***Kumgang mountain is located in North Korea’s part of the Gangwon-do (Kangwon-do) state. In a school trip to an art museum, we were able to see early paintings of this mountain from before North and South Korea divided. Appearance, race, and beauty standards as a foreigner in a small town in Korea. I had a lot of reasons to feel nervous before coming to Korea, but for the most part, I tried to keep bits of optimism wrapped around any wariness I felt. Not knowing Korean beforehand was an opportunity to learn another language. Leaving home for a long time was a chance to delve into a new work experience and get to know more people. I could learn to cook new foods, grow out of my comfort zone, take up new hobbies and interests- everything had an upside. As I grew closer and closer to leaving though, I was surprised to find one specific worry salient in my mind: my appearance. Or rather, appearing conspicuously “foreign” for an entire year. I was annoyed at myself for thinking about it so much, especially when I knew I had more pressing concerns. Moreover, I grew up in a school with a relatively small minority population, and had traveled before to other countries- I should have already had some sense of what it was like to blend in or out. Running into my students at a local park in Hwacheon and sharing snacks. But I knew coming to Korea would be different on some level. There was the length of time and independence of course. I also was aware of the fact that working as an American English teacher could create certain expectations in a new country. Our orientation packet warned us that non-white Americans could receive mixed reactions when they met new people, and I feared on some level my school or host family rejecting me or needing me to explain myself. On a more visceral level, I worried about being peeled away from my Indian roots, the absence of a language, culture, religion, and arts that kept me tied to something within America. I would be afloat. Evidently, this topic has been on my mind for a while. Nevertheless, I tried to stay aware of my own worries so that I could be receptive to everything and everyone this year. Things ended up working out in many ways- I’ve had so many positive interactions with my school, host family, and friends here. In retrospect, I think a lot of my stress early on came from preconceived worries rather than negative experiences. That said, given its presence in my mind, I still wanted to touch upon some of the experiences I have had with appearance before I left, in hopes that they may be good to reflect upon and useful to anyone else, including future applicants facing similar worries. I came to Korea with three travel booklets, my U.S. passport, my Canadian passport, and a Person of Indian Origin Card. I always liked the story these papers told, a brief history of my past and present. In most of my interactions in Korea, these distinctions don’t really matter- to most people, you are either a hangukin (Korean), or waegukin (foreigner), and I am clearly the latter. I had mentally prepared to explain and discuss my background and talk about America and India. I didn’t anticipate that most people just needed to know that I was a foreigner, period. In a lot of conversations, being a waegukin, being non-Korean, is considered an identity unto itself, and one that is referred to with great frequency. I overhear the term a lot, and I’ve been asked many questions about non-Koreans as a whole: “Do foreigners like spicy food? Why do you like spicy food?”, “How do foreigners date?”, “Do foreigners like to shower in the day or the night?”. Coming from such contrasting cultures myself, I struggle to produce a response without generalizing or losing nuance. But outside of these discussions, I usually am fine with being called a foreigner so frequently. Besides being a truly honest term for me, I know that the fascination is coming from unfamiliarity. Foreigners, especially ones that look like me, have only recently started visiting Korea, and in smaller towns like my own, they are still a rare presence. I’m a new and unknown person, and people are curious. In all honestly, the term is sometimes a relief. When I first heard the word used collectively in my school and host family, I felt that it in some ways, put me on the same ground as all other foreigners, regardless of race. Occasionally though, people do wonder about my background, and that is usually when the conversations steer into more difficult territory. On walks home, I have on several occasions been stopped with enthusiasm by old men. “African? Indian? Where are you from?” they’ve unabashedly called after me as I stroll by. Even when I’ve had conversations about India with people that I do know, the discussions tend to take a particular direction: missionary trips, comparing caste systems in India and Korea, poverty, etc. Making kimchi with my host family as a part of the annual kimchi making weekend. Some of these instances were disorienting. At the same time, I also felt somewhat freed by the lack of expectation. No one really knew what or who I was, and while I was separated from a lot of my ties to America and India, I was also not beholden to my communities from back home, from my old schools, to my town, to my cultural and social groups. So, I took a step back and tried to gain a little bit of perspective and patience. I took the extra step to form more full-fledged conversations about different countries when I was asked about being a foreigner. I tried to speak more personally about my own family’s experiences as Indian-Americans. When my host mom gifted me with a hanbok (traditional Korean clothing), I showed her how to drape a sari (granted, after painstakingly searching YouTube and calling my mom for help). In class, I tried to make it a priority to incorporate diversity in slides and stories, which ended up making the lessons a lot more meaningful to me, and hopefully to my students as well. As I started to stay more informed and doing more research for these types of conversations and lessons, I ended up filling in and realizing gaps in my own knowledge, about my own culture and others. Overtime, I found a personal sort of balance with myself. I watch Korean comedies with my host family after dinner and then read American books or watch Bharatanatyam videos before I sleep. I learn delicious Korean recipes from my host mom and try and meet my cravings for other kinds of food on the weekend. Removed from home and my communities, I wondered if those parts of me might fade away. But they’re still there in me, a beating heart pulsing steadily. Wearing a sweater over a hastily draped sari as I try to cook a curry. Background is one aspect of appearance, but there’s also a more superficial, day-to-day facet of how we look, the part that interacts with the beauty standards around us. Prior to coming to Korea, I had heard that beauty ideals played a pretty large role in day to day life. I felt mostly unconcerned, thinking that I had passed the point of caring. I rarely prioritized my appearance in the States and couldn’t really be measured against Korean beauty standards, so it seemed irrelevant. Once I started Orientation though, I started to hear from other minority ETAs about the odd, sometimes upsetting comments they received about their appearance. An Indian-American ETA from a previous year had been rejected by their host family after meeting face to face. Slowly, I started to build a feeling of caution, and dread. During my first few weeks in Korea, I felt hyper attuned to the way people were reacting to me. My fellow ETAs who were white tended to draw a great deal of attention and praise when we went out in public. Friends would come back in shock that their light skin or eyes or golden hair was being complimented. On my first day teaching at Elementary School, students swarmed the other foreign teacher’s desk, playing with her hair and complimenting her face. In the afternoon, one student came up to both of us and pointed at our arms, “White and black!” she said, giggling before running away, almost in the same moment. When my friend turned around to ask how she could help me going forward, I was genuinely unsure of how to proceed. All foreigners receive some attention of course, but I couldn’t help but wonder if there was a difference in how people were reacting to me. Other foreign looking ETAs would have random strangers ask to take pictures with them, but people seemed to take pictures of me in public without asking. Even for more tame activities, like visiting skin care shops, friends would pour into beauty products and lotions, while I cautiously scanned the items I was being handed for any skin whitening agents. My host parents wanted to take a picture of me at the dakgalbi festival. Within seconds, other families came over and started taking pictures as well. When I did receive a compliment, it felt like a sign of acceptance, a breath of relief. During my first interaction with my host family, I waited nervously for any sign of hesitation as they talked to me. Instead, while helping me drag my luggage up the stairs, my host mom gave me a smile. “You look beautiful!” she said earnestly. Some tension immediately slipped from my shoulders, my suitcase lighter in my hands. Truthfully, for the most part, I’ve been treated very nicely in regards to my appearance. While parts of me may not fit Korea’s convention for beauty, the people around me tend to latch onto the things about me that are considered “nice” here. At this stage, my foreign appearance has even been an asset, with random strangers offering to help me when I’ve been lost or confused on more than one occasion, usually due to gaps in my Korean knowledge. My students frequently comment on my big eyes or small face (one particular ideal that I’ve only heard in Korea). Usually these compliments will also make me uncomfortable. My female students especially tend to examine me in direct comparison to themselves, scrutinizing the size of their own eyes in the same swoop that they compliment mine. Comments about appearance are frequent and direct in my day to day life in Hwacheon. It’s more or less socially acceptable for coworkers or people of different age groups to comment on one another. The Principal, other teachers, even my students are happy to come up to me anytime with a proclamation about how I look that day. Usually, these are positive, although I do sometimes get comments about the bags under my eyes or looking tired. When I cut my hair, some people directly told me they liked it, while others gave me an uncertain, “I don’t like that”, and one, “Have you gone through a recent trauma?” Conversely, when my hair started to get longer, I received advice that I looked better with the short hair. This scrutiny applies to everyone of course, not just me, or other foreigners. Instinctively, I worry about the pressure that these standards put on both my male and female students and friends here. Many of them will brutally make fun of the appearances of even their closest friends, at a level that would have been mortifying for me in school growing up. From a young age, my students put a lot of thought into their appearance, with dyed hair and fashionable clothes, curlers and lipsticks in even the 4th and 5th grade. My host parents and their friends frequently crash diet, yet are also deeply proud of their ability to eat well. Statistically, Korea has one of the highest rates of cosmetic surgery in the world, and several young students have told me about their plans to change their eyelids or noses as they get older. Taking pictures of one another. There are a lot of studies and think pieces about self esteem and pressure in Korea, and its easy to judge from afar. But I truly can’t say that there aren’t any positive elements of this beauty culture that I’ve appreciated during my time here. For instance, beauty is an expectation for everyone, with both men and women told to dress and groom themselves to a high standard. The directness about appearance also translates to a sense of openness; there is no shame or secrecy in feeling self-conscious, or spending effort in your looks. Women and men talk about their acne, skin problems, and beauty regiments freely. Beauty and appearances become a shared center point, something to participate in. Face masks, hairstyles, and fashion all have a social element, and it’s been fun sharing and learning about these elements while I’ve lived here. Coming from a family and culture where appearances are also often bluntly assessed, it has been interesting to experience this in another country. When I was younger, I used to be dismissive, or even aggressive when relatives scrutinized my appearance. In Korea, first out of politeness, and later due to perspective, I’ve started to change my approach. I’ve come to see the comments about my appearance as signs that people are paying attention, whether they are complimenting me, or worrying about my health. I try to keep that in mind when I react or correct others. Early on in my homestay, we took a picture together at a photo studio, and I found that my face had been distorted and whitened in the picture. Instinctively, I felt hurt, but after seeing my host family’s joy at having this studio portrait of all of us, I refocused on how sweet it was that they wanted this in the first place. Very photo shopped, but truly grateful for my host family. Beauty in Korea is complicated, but beauty is complicated, often unfair, almost anywhere. There’s the preference for lighter skin in some communities, or the expectation for women to spend exorbitant amounts of money and time on their presentation. Even not complying to beauty standards can be a costly endeavor. One professor summed up the difficult culture of beauty in America, where “we pummel them with a standard of beauty they will never meet,” and then “when they worry about beauty, we call them superficial.” Most of time time, I’ve been quick to express unhappiness or anger with these standards, but in Korea, I am an outsider looking in on a set of ideals that will never apply to me. I cannot participate or protest- I can only learn, and accept and support the people around me. Korea’s relationship with beauty and race has been interesting to learn about this year. That said, I’m certain that my levity and openness to these experiences stem from the fact that I am passing through Korea instead of firmly grounded in it. For my students, co-teachers, and friends, these cultural attitudes and perceptions have a deeper impact. For instance, in my town in particular, there is a large population of families with migrant mothers. From the 1990’s onwards, Korea has had an influx of women from other Asian countries who marry into Korean families, a practice encouraged to keep the population growing. While the current model of immigration in Korea is focused on assimilation, there has been an effort to expand resources to these families. Many of my students have mothers from Vietnam, the Philippines, and Thailand. Yet, these students are usually almost completely immersed in Korean culture in their day to day life, with some visiting extended family abroad on holidays. Perhaps due to the demographics of my school, I’ve rarely noticed any tension among the students. There even seems to be an effort in the county to support these families. For instance, my school recently started a program for migrant mothers to teach Vietnamese to students after school. That said, I’ve heard of other schools where students were picked on for not looking “as Korean”, or moving to Korea later and struggling with the language. Assimilation may no longer be the only way for these families to exist in Korea. I sometimes wonder how these students perceive their identities, and how their perceptions may change if attitudes towards assimilation change. It’s not just them: there are millions of Korean’s in the diaspora, with various backgrounds, cultures, or mixed heritages. There are migrant workers and their families and children building long term lives in Korea. The definition of hangukin becomes less and less clear cut with time. I’m curious to see how these conceptions of beauty and race will change over time. There’s a lot of discussion within my town and school, and at a larger level in Korean media about these topics (and almost certainly a lot of conversation that I’m not even aware of). For my part, I’m grateful for the glimpse I’ve had in into these perceptions this year. Despite a few challenges, I cannot emphasize enough the kindness, the safety, and the security I’ve been given in so many ways during my time here. Coming to Korea has reminded me to listen a little bit more, and hopefully that translates in the discussions I have with my students and friends, both here and in the future. One of my favorite memories here- my host mom randomly came home and asked if I’d like to go outside and take pictures by the river while the weather was nice. At the end of fall semester, I had a few weeks’ vacation in January. The timing was perfect- energy levels among students and staff had started to dip with the end of the year. Likewise, the temperatures in Hwacheon plummeted to consistent icy temperatures, with bitter winds and soggy shoes greeting me on every commute home. While we have the choice of using our vacation in a variety of ways, I decided in early November that I wanted to use the time to travel. Leaving Hwacheon in the midst of its world famous winter ice fishing festival, I began my travels in Taipei, Singapore, Bangalore, Hyderabad, and Bangkok, making parts of the journey alone, and others with family and friends. Away from Korea (and its winter) I took my time appreciating the food, language, and cultures of other places, and had the space to reflect on what I was looking forward to, as well as the many things that I missed back in Korea. Now, with spring creeping into Hwacheon, I wanted to take the time to note some of the small moments that passed by in winter. It was a scattered, busy season, filled with festivals, and new semester stress, Olympics games and international crowds, reunions with family and friends, and memories from five different countries. Too much to tackle all at once in writing, instead, I’ve decided to share these times mostly through some images, in hopes that they capture just a little bit of the season. Although I only spent a few days in town for the festival, it was thrilling to see people from all over Korea, (as well as many international visitors), come and be enthralled by this little town in the mountains. Stores and streets were vibrant with decorations and people. Many of the town residents are not a fan of the “increased traffic” and crowds during the celebration, but for a few nights at least, it was magical to see Hwacheon transformed into a winter haven. Going outside of Korea after a long time was a disorienting experience. Although all of the countries I visited were also in their winter, they were closer to the equator, so the weather was mostly intense and thick heat. While I appreciated the warmth, I was also clearly under prepared for it, frying in the humidity within hours. With each day, I realized how much my understanding of these countries had changed now with my perspective of Korea. I marveled at calligraphy and trade exhibits in the National Palace Museum of Taiwan and was stirred in the National Gallery by displays about the Japanese occupation of Singapore. There was also the joy of rediscovering familiarities that I had been unconsciously missing. I voraciously took in every meal, inhaling the different flavors, especially the fish curry at my grandparent’s house. In Singapore, someone asked me if I was “a local” for the first time in months, and I felt a strong tug of emotion in my chest. In India, my grandmother interrupted me to gently correct my Telugu while speaking with relatives, and while I felt a little embarrassed, I felt happy to be speaking it again, and warmth from the familiarity. In Bangalore, after briefly visiting my aunt and uncle, I made a stop at Shanti Bhavan Children’s Project, a school that I worked with in college through an on campus organization, Tufaan. Almost two years ago, I taught English and history classes there during the summer, and got to know a lot of the students in the process. The school aims to provide a free, elite education to children from socioeconomically underprivileged families, supporting them from kindergarten through college. * When I arrived on campus, many of my previous students were getting ready for their board exams, but getting to see the kids again filled me with happiness and nostalgia. It was near the end of my summer at Shanti Bhavan two years back that, on a phone call with my mother outside of the volunteers’ office, I had decided to apply for this current teaching program. I marveled at how much of an impact the kids had on me, how much I had improved as a teacher, and how mature and thoughtful the senior class was when discussing their futures. Taipei’s subtropical climate gave the trees a lush look in the rainy winter. Spent a lot of my Singapore visit in parks and gardens laid out throughout the city. Chinatown- Singapore was fascinatingly diverse and multilingual, with public transportation instructions displayed in 4, or occasionally even 5, languages. *Shanti Bhavan’s aim is to fight poverty; many of the students go on to high earning careers, which they use to support their families, communities, and younger Shanti Bhavan students. If you are interested in learning more about Shanti Bhavan, please check out their website, or see the school and kids featured on the Netflix Documentary Daughters of Destiny. They are currently in the process of building and raising funds for a second school, which you can learn more about at https://shantibhavan2.org/. Getting to visit every few years means being extra excited when there are big changes- like the Hyderabad Metro. A short visit to Ramoji Film City, Telugu Hollywood. Cooking class and new friends! Despite relishing in the things I missed while abroad, spending time away from Korea made me grateful and eager to make the most of the time I had left. There was so much more Korean to learn, so much more to see, so much more time to spend with my host family and friends here. With new lessons and a new wave of commitments for the new semester, things are a little bit frenzied, but for the most part, it’s been a purposeful kind of busy. While I still have months of time left before I leave, I can’t help but feel that so many moments have passed by quickly, and so many more will. With the dawn of spring comes exciting festivals, and school events, and mountain sceneries, but as I count the weeks, I feel the brevity of my remaining time. “I can’t believe you’re leaving so soon,” my host mother exclaimed, as we flipped through the calendar after dinner one night. “Me too!” I agreed, eyes stinging at the thought. “We’ll just have to really make the most of these next few months. And eat lots and lots of ddeokbokki,” I joked, half serious. When I arrived in Hwacheon in mid-August, it was actually the start of the second semester of school. Before my first day of work, my stomach was in knots, and I woke up with nerves three hours before I needed to, but when I strolled into school, I was greeted with carefree smiles and unfettered students. Kids and teachers alike were coming back from their summer vacations, resettling into the roles and routines they had grown comfortable in. Class dynamics had been solidified, their daily schedules remained more or less the same; a rhythm was in motion and it was my job to jump into the pattern as seamlessly as possible. In the beginning, the only way to catch up was to constantly be working. I spent hours sifting through the textbook, trying to figure out what was relevant and what would be boring, how to best pick up where the previous teacher had left off. I was determined to do well, while also afraid of disappointing my co-teacher, my students, and myself. Despite this, once classes officially commenced, mishaps inevitably occurred. The Thursday before classes started, I pulled my co-teacher aside for approval on the materials I had worked on. With a great deal of patience and kindness, she smiled and nodded as I spoke, before apologetically informing me that the book I had been using was mis-marked: the students were actually about to start the previous chapter. Equally bewildering was my first attempt to use the smart board. In front of my students, the touch screen kept on freezing. It took a few zealously helpful fifth graders and a quick assist from my co-teacher to get things on track. Eventually, it took less time to think of games and ways to present materials. I learned a few key classroom phrases in Korean (“sit down!”, “stop that!”, and more positively, “keep trying!”). I moved staplers, computer keyboards, and pointers, just before students tried to grab them. I looked forward to the little conversations I got to have with students between classes and after lunch. Most importantly, I gained a stronger sense of buoyancy. I owe a lot of this to learning from my co-teacher. No matter how stressful or seamlessly a class went, once it ended she would immediately touch base. “Do you think this activity should be a bit longer? Maybe if we change the way we explain this concept?”. Then two minutes later, unfazed, she would be rearranging our materials before the next class rushed in. Whether a class turned out great or ended up being a fifty minute frenzy, it was important to shrug it off, learn from what you could and start fresh once the next class started. By December, we wrapped up our textbooks, and in January, Dana and I ran a week long winter camp before setting out for our winter vacation travels. In the midst of these travels, we reached the official halfway point of our year here. When I landed in Korea again, eager to see all of people that I had missed the previous few weeks, I was struck with the realization of how quickly my remaining time here would pass by me. Throughout February, while I’ve had no classes, I’ve been at work. Thus, I’ve had a lot of miscellaneous free time. I’ve been brainstorming a few ideas for lessons, reading books, studying Korean, and making bread with my co-teacher. Dana and I even got to assist and taste test a fourth grade cooking class, and then joined the students outside for Korean dodgeball. Meanwhile, the students made preparations for the upcoming 6th grade graduation, many of them coming to the English room to say a quick goodbye (and to ask for “graduation candy”). Because of limits on how long teachers can stay at one school*, there have also been a lot of teachers moving out with teary goodbyes, including one of the English teachers. At the same time, a sea of new faces have moved in. In a few days, I will find out what grades and classes I will be teaching,** and when March rolls around, my 5th graders will become 6th graders, and a new year will begin. It’s a time of flux, and for a change, the entire school is morphing together. My coworkers are quickly packing their things and switching classrooms, my old students are buying uniforms for middle school. Meanwhile, while my days of desk warming*** range from the productive to the more stir-crazy, the free time has given me a lot of time to reflect on teaching so far, and a chance return to some of the thoughts and worries I had about this experience prior to coming to Korea. In my first blog post, I mentioned how my decision to apply for a teaching grant stemmed partially from how much I had enjoyed the short-term teaching experiences I’d had in college, and partially from how gratifying the experience of learning new languages has been for me in the past. When I received my acceptance however, my excitement was mixed with caution, and I spent a lot of time researching the role I would be taking as an ETA so I had an idea of what to expect. Specifically, I worried about teaching English. While my desire to learn languages in the past has stemmed through curiosity and interest, or exploring personal ties to other cultures, I knew for my students, English would be mandatory, potentially even a source of distress. I worried about contributing to that in some way while here. I wondered how English was perceived in Korea. Like many lingua francas of the past and present (Latin, Arabic, Mandarin, French etc.) English’s predominance in the international arena today stems from a historical power imbalance, particularly British imperialism and American influence. At the same time, use of English worldwide today coincides with an increasingly globalized and connected world, and having a connecting language can clearly be useful and practical for a country with global interests. Historically, attempts have been made to create more neutral man-made global languages. In 1889 Volapük, created in Germany, claimed to have garnered nearly a million speakers. Today, Esperanto, developed in Poland by an opthalmologist, is the most widespread constructed language still in use. Yet none of these languages ever managed to build momentum in a global community. Without existing roots and cultural ties, it was hard for these languages to gain as much traction as preexisting languages which, however perniciously, were already integrated into the infrastructure of many countries. Nevertheless, using English as a common language doesn’t necessarily have to be a bad thing. The onus on learning English falls on everyone outside of native speakers, and while that can sometimes reflect historical power imbalances, other western European countries with similar histories have had to learn English today as well, and many heavily recruit ESL teachers. In a modern context, the practicality of connecting with a shared language to complement local languages can theoretically pave the way for easier trade and diplomacy. Since coming to Korea specifically, I’ve noticed that for the most part, Korea’s investment in English, and teachers’ and students’ own personal motivations for studying English feels removed from the direct history of the English globalization. It has is less to do with America or the UK, and more to do with the world. Broadly, Korea wants to stay competitive internationally in business and other sectors. Korea also has a fairly large population of students that go abroad for their education. A lot of my teachers and students, even in my small town, have siblings, or children that are attending a portion of their high school years abroad. Korea has the third largest population group of international students to the United States. Conversely, my host mother told me that for her personally, and many of her friends, the desire to learn English stems from the simple convenience of traveling to other countries with the ease of having English in their arsenal. After tests, my students will often write short letters or make cute drawings on the back of their exams. I have tried to accumulate a steady collection of my favorite notes. Even beyond history though, there other drawbacks to using English as a common language. For instance, teaching English in classrooms around the world can create an imbalanced burden on some countries and students. The odd spellings and grammatical rules are much easier for some foreign language speakers to learn. For speakers of Arabic, Mandarin, Japanese, or Korean, where the script, grammar, and vocabulary is so different, it can understandably take a lot more classroom time to reach the same level of mastery as a French or Norwegian speaker. Even created languages, such as Esperanto, tend to mimic the script and grammatical rules of only some language groups. That said, Korea understandably doesn’t seem too preoccupied with Korean being threatened. For most of its history, Korea has had a strong national identity with a mostly shared linguistic background. Today, Korea has its own Korean map system, its own messaging app, and a growing and internationally popular collection of Korean literature, TV, and music. In fact, Korean itself actually poses a threat to another language, Jeju-mal, the language once spoken on Jeju Island in the south of Korea. Today, only a few thousand speakers remain, mostly of an older Jeju generation, while young students on the island tend to speak standard mainland Korean. Despite not being directly threatening to Korean, English education can be a large source of stress for students especially, who want to do well on their exams and stay competitive for colleges and jobs. It can also end up being costly for parents, many of whom invest a lot of money to send their children to supplemental English classes. All this stress is especially unfortunate given that, with the exception of a few careers, in the day to day lives of most adults here, only Korean is really needed to get things done. While meeting with a Korean high school student recently, she showed me her suneung (national exam) practice books. As I flipped through the English section, I was shocked to see how difficult the passages were. I came across a lengthy and confusing short piece on the neurochemistry of ADHD followed by a series of confounding, equally lengthy multiple choice questions. Whenever I ask to my co-teacher about English in Korea, she mentions that there are currently a lot of policy changes being debated and enacted related to teaching restrictions and exams, hopefully with the aim of lessoning the stress of English education. 1st and 2nd graders will no longer be allowed to take English classes in school. Additionally, the grading methodology for English on the suneung may change to a pass/fail, or graded in tiers system, hopefully allowing students to concentrate on other subjects once they get to a certain level. I try to embrace my role as an English teacher by focusing on what I can offer to my students: a chance to practice English is a low-stress environment, and hopefully build confidence and speaking skills. I try to make sure that I convey that I am encouraging English practice, and not promoting English as a necessity however I can. I also try to emphasize clarity of speech over pronouncing things just like me. My advanced students seem to enjoy the extra chance to practice, while some of my students who struggle a little bit more hopefully see how much I appreciate it when they offer me even a few words in English. I want to make sure I’m supporting my students, and next semester, I want to check in more with my co-teacher to ask for feedback, and to ask questions about students, hopefully improving as I go along. When I did my round of research and talked to previous ETAs, one of the biggest things that stuck to me was the glowing reviews and clear bond that a lot of the grantees had with their students. They raved about how sweet and respectful their students were to them, and talked about how much they missed these kids. I knew that each placement, and age group of students would be a vastly different experience and kept fairly tempered expectations prior to arriving in Korea. That said, when I arrived in Hwacheon, I was genuinely surprised by warnings that I received about some of my classes. “They can cause a lot of trouble,” one teacher warned me in earnest. Another told me point blank that I would have a very hard time. Indeed, some classes were dizzyingly difficult. In an instant, a quiet classroom could disrupt into a chaos of noise and students moving around. For one of the more difficult groups, I remember seeing how stressed the homeroom teacher was prior to receiving her open class evaluations. Knowing that many teachers struggled with some of the students should have helped a bit, but I still felt a lot of worry for them. I hated the idea of failing them in any way. I found it most motivating and uplifting when, out of the blue, a teacher would come up to me and advocate for their children. The, “I know they cause a lot of trouble, but you can’t give up on them!” and “They have really good hearts, try your best to see that when they cause trouble,” were maybe a little saccharine, but filled me with determination and resolve. Sometimes, things would hit a stride for a few weeks. And then, out of the blue the disciplinary problems would rise again, and things had to be changed up. My co-teacher and I ended up spending a lot of time discussing different strategies to help some of these classes go smoothly, but it really was hard to predict what would work on any given day. Along with the difficulties though, I really did love my students: in the easy classes, and the hard ones. I loved it when they cared for each other without asking. Once, in fifth grade, a girl inexplicably started crying in the middle of class, and all of friends promptly came over and gave her a hug. Another time, when one of the boys started to get frustrated with an activity, the student next to him told me not to worry, and that they’d work on it together. In December, in sixth grade, my co-teacher had to step out to discipline a student half way through class. Because of the way we had divided this lesson, I realized that we had finished my portion, but I also didn’t have access to my co-teacher’s materials for the next part of the lesson. Sensing some hesitation on my part, my students surprised me by telling me not to worry, and to just keep going. Slightly embarrassed and touched, I picked out a few sentences from the textbook, made up the game on the fly, and the class went along. My students surprise me a lot. They can be apathetic and rude, but also kind and respectful and sweet. They can be level headed and helpful, or start picking fights out of the blue. They’re still figuring a lot out, and growing into themselves, and it’s kind of marvelous to be around for. It was bittersweet when the sixth graders graduated. I worried about some students adjusting to the strictness and rigor of middle school. I wondered how these 6th graders, who loved their red lipstick and t-shirts with random english phrases, would handle the uniforms and the jump in difficulty of English class. I worried about some of my students with additional needs, wondering if their teachers would care for them the way I’ve seen the Elementary school teachers care for their students. In a small town like Hwacheon, I’ll still see them around, but I’ll miss the routine of seeing them every day. Soon though, they will start middle school, and the Elementary school will begin a new year. I’m sure it will be challenging at first, but there’s some comfort in knowing that the teachers, the students, and everyone will be adjusting together, day by day until we find a new synchrony with one another. *Teachers in Korea have a limit on the number of years they can spend in one school. This is done partially to keep talented teachers from accumulating in one area, and allows them to receive benefits and salary increases proportional to how many years they’ve worked overall, rather than just at one school. **An update to when I initially started writing this post: I will be teaching 4th and 5th grade next year! ***Deskwarming is a disgruntled term for being at school for long periods of time when there are no lessons or other administrative work to do. **** In my most recent visit to Hyderabad, I was surprised to discover that for movies, a lot of the songs and scripts are not written out in Telugu script, but romanized. The practicality of this became more clear when I realized with how linguistically diverse casts could be. Coming from different regions of India, it’s easier for them to piece out English spellings of Telugu words than Telugu spellings. *****One thing I found out about Fulbright in the summer of last year was that they have language exchanges both from America, and in America. ETAs teach English in different countries around the world, and FLTAs (Foreign Language Teaching Assistants), come to America from a variety of countries and language backgrounds to act as native teachers in the U.S.
Hwacheon has recently hit winter, and its presence lingers in every part of the day. The colder it gets, the more tempted I am to sleep in just a little bit later. Still, I try my best every day wake up with ample time to spare before breakfast, sometimes sneaking in a quick call home. Now and then, my host family is in a rush too, roaming in and out of the kitchen, toothbrush in hand, occasionally with the laundry machine humming in the background. I’m usually the first one to get to the shared English classroom. I turn on the lights, restart my computer, and turn on the heater. Usually, the other students who’ve arrived early swing through at some point in the morning. Sometimes they’re looking for another teacher, hoping to clarify assignments. Other times they just want to talk; one student came to me with a stack of yellow and blue cups, and decided to spend 10 minutes showing me her cup stacking skills. When my co-teacher arrives we quickly set up for the day and discuss any changes in our plans for our classes. As the clock nears 9, I sit back in my chair, waiting for the familiar burst of students through the door for our first class. In part 1 of this blog post, I tried to discuss some of the highlights of my more formal obligations for this grant year, and the opportunities that they have given me to travel, learn, and connect. With the onset of winter, I’ve still been traveling and exploring Korea, but my daily life in Hwacheon has grown into something consistent and familiar and sweet, from morning routines to anticipating student antics. With that, I wanted to share a few pieces of my day to day life in Hwacheon, and the community I’ve come to know and care for since arriving here. Amongst ETA’s, the Fulbright program likes to stress the notion of a “fourth point.” Essentially, by nature of our grant year, we have to devote time and concentrate on “three points,” our cohort, our school, and our homestay. The fourth point is supposed to be a project or hobby that keeps us learning, fulfilled, and/or happy outside of this time. As such, it has become pretty common to joke about the mundane repetitive activities in our day to day lives being our fourth point. (“Lying in my bed at nine p.m. with a face-mask? That’s my new fourth point,” or “My fourth point will be learning how to download GIFs into power points while eating snacks”). I still appreciate the phrase, and the idea of being intentional about how we balance our daily lives. That said, as always, there are days when I’m wiped out and just want to lie down and listen to music, and others where there’s so much to do and appreciate, and such little time. Thus, I’m not sure whether I’ve found a fourth point exactly, as much as a bunch of fluctuating extra points that rise in and out of importance every day. The outline of my evenings remains pretty steady nonetheless. Oftentimes, once school ends, the other ETA’s and I will try to stop at one of the many coffee shops within a short radius of my school. I spend a good deal of time chatting with my host family before and during dinner. When I feel particularly motivated, I try to take short runs outside to get some fresh air, although as the ground has become coated in ice, this has become less and less permissible. In between those hours are the “scattered points”. Some days, especially lately, I make a hard effort to practice Korean. I use online resources for grammar, a textbook I bought in the States for occasional vocabulary, and have started taking occasional Skype tutoring classes as well. * Despite this, my Korean is far from where I’d like it to be, especially in reading and writing, probably due to how irregular my study schedule is. There are some moments where I can breeze through a conversation so quickly that I catch the surprise of the person I’m talking to. Then there are many, many other times where I struggle to piece together words, or desperately blabber pure grammatical nonsense for minutes at a time before realizing that I’m answering the wrong question. Despite these fluctuations in my ability, I really enjoy “speaking” and practicing Korean whenever I can. Even saying the same few sentences while ordering tea after work makes me feel elated. One of my regrets from previous experiences abroad was not feeling emboldened enough to practice the languages that I learned as much as I would have liked to. In some of these instances, the people I interacted with knew English so well that it felt impractical to try to converse more poorly in another language because of me. Other times, I would feel self conscious as I stumbled over mistakes. Regardless, I would regret the chances I missed to practice immersively. Here, I try to appreciate the value in every word of Korean I try to say, even if some days that just means telling my students to “sit” and “pay attention now, please”. Outside of studying Korean, I have also been reading again, and have been making an extra effort to find books by Korean authors**. On the weekends, I try to travel to other cities outside of Hwacheon, spending a lot of my time (and stipend) exploring Seoul and Chuncheon, occasionally making longer trips further south. I have also been helping out with an organization called Fulbridge. The site was started pretty recently by previous ETA’s as a way to connect grantees in different countries for traveling, lesson planning, and other cross cultural initiatives, and has really expanded since then. Currently, I’m helping with the launch of our alumni map, in hopes of extending these opportunities towards alumni as well. I actually recently used Fulbridge to set up a pen pal program with some of my more advanced students in the 5th grade and a few students from a middle school in Taiwan. At first, my students were frazzled and asking a ton of questions (Were these students in Taiwan “real”, or just Paavani Teacher writing fake letters? Are the students older than us? Is English their first language?). When it finally dawned on them that the other students were in fact real middle schoolers and also learning English as a second language, they grew both enthusiastic and nervous, eager to impress their older counterparts. We’re currently in the process of getting letters back, and I’m actually planning on briefly stopping at Taiwan during my winter vacation and getting lots of pictures and hopefully more information about our partner school to get my students excited about continuing these letters. In between the changing schedules and activities, one much appreciated routine every week has been my Tuesdays. Every Tuesday, once school ends, the other two ETA’s in my town and I grab dinner with a friend of ours who runs a lovely traditional tea shop and teaches calligraphy classes. After we eat, we take lessons late into the night and all four of us drink tea and catch up while we practice our new letters and words. Our calligraphy teacher is one of the few young people I’ve met in Hwacheon who isn’t a soldier, just five years older than me. She’s extremely kind and has a fun sense of humor. Tuesday’s this semester started as one of my most exhausting days with six class periods, but have become something I look forward to every week: some time to relax, learn, de-stress, and enjoy the company of friends. In mid-November there was a historically large earthquake in Pohang the day before the Suneung, Korea’s major college entrance exam. *** Other ETA’s described their students’ mixed emotions: nervousness, fear, and stress, first from the earthquake, and then from the exam being moved by a week. Many teachers said their students seemed exhausted around exam time. The stakes were high and palpable. In Hwacheon Elementary School these worries feel as far as possible from my students. The kids are mostly just interested in being young– weird, playful, confused, and funny. Some of the students are super motivated in class, some attend many hagwons, and others are visibly counting down the time until lunch. The students spend a lot of time in the hallways playing games with one another. During in-class movies, they all cuddle up with one another and share snacks. When a student struggles in class, their peers get out of their seats to give them a hug and help them, and my heart beams at them. It’s uplifting to see this, especially in my more rambunctious and difficult classes. Right now, it’s important for my students to grow into good people, and it reminds me to strive to do the same above all else. In their small town, the kids have a sense of safety and kinship with everyone. The ride their bikes late at night and meet up at computer rooms in town to play games. They video call one another as they play clash royale and meet up at Mom’s Touch, a popular fast food chicken restaurant, for snacks. After the first snow, my host brother and his friends spent 20 minutes messing around with used salt bags to create an astonishingly resourceful makeshift sled. The security and closeness of Hwacheon as a town is often extended to us as well, for better or worse. Within the first few weeks of living here, gossip had already quickly spread about all three of the local ETA’s, from seemingly out of the blue. Did we go to church? Where did we study? What did we look like? While it felt odd and made us a little bit self aware, I’ve also seen the teachers in my school extend a lot of caring and warmth to students because of how acutely aware they are of the children’s personal lives. For the most part, people in the area are incredibly kind to strangers. Once, while a friend and I were looking for food in Chuncheon, an old woman stopped us, asked us if we were looking for a good place to eat, led us through a maze of the local market, and then dropped us off at an incredible Vietnamese restaurant before heading off on her way. Another time at a coffee shop, one of the workers approached us out of the blue and said that we seemed nice from previous instances she’d seen us around town and said that she would like to be friends. My demographic of acquaintances and those who I am close with in Hwacheon is undoubtably different than previous years of my life. Outside of my students, who I adore greatly, and the other ETA’s (who I also deeply appreciate), most of my interactions in town are with older adults, a majority of whom female. Almost all of my co-workers and the people in the town that I know seem to have at least a decade or two on me. They’re the ones who greet me in town, or scold their children when they forget to insa me. They’re the ones who come over to me and ask me about my life here during large gatherings like school dinners or family reunions. They’ll tell me about their children who are in college, or their goals when they were younger. They’re my host father and my host mother and my co-teacher and even my just slightly-older-to-me calligraphy teacher. In the absence of similar-aged peers in town, I’m both grateful and surprised by those who have cared for me and invested in me since arriving here. These are the people who have taught me the most about Korean culture by welcoming me into a glimpse of their lives. I pick up small things from them along the way– like slang, and silly jokes. Or even when my host mother explained to me that showing your toes is not really considered a taboo in Hwacheon (despite being told earlier that it was generally to be avoided in Korea). Perhaps these bonds surprise me because of how much the importance of hierarchy and age is often emphasized when explaining Korean society. For instance, the word “친구” translates to “friend”, but the Korean word is only used for people who are actually the same age as you. **** Other relationships are described differently, addressed literally like younger and older brothers and sisters. This doesn’t mean that “friendship”, as it is understood in America, doesn’t exist between different age groups. It is just merely acknowledged that there are differences in these kinds of relationships. It’s something I’ve come to see and appreciate in the adults in my life here, who guide me around and help me often. But after a difficult class, when my co-teacher and I discuss our frustrations over a recently boiled cup of green tea and share snacks with each other, or late at night when my host mother and I joke about confusing English and Korean words, or on Tuesdays when we’re all eagerly chatting while concentrating on calligraphy brush strokes, the bond is still there, and I feel grateful for the presence of these friendships. *I will post some of the websites and resources I use to study Korean on a separate page on this site, in-case they might prove usefull! **If you have any recommendations for any books at all, please send them my way! **** Korea uses two different age systems: the international age– which is based off of your birthday and the same as the in the States, used for some official things and age limits. Then there’s the “Korean age”, which is what most people use in their day to day social life. At birth, a child starts at age 1, and then gains an age the following New Year. So, a child born New Year’s Eve would be 1 the first day, and promptly turn two the following year. Because of this system, students in one grade all have the same “age”. For quite some time now, I’d been looking forward to October in Korea. When I first arrived here, the weather was unrelentingly heavy and humid, and many people told me about how lovely, albeit short, the upcoming fall would be. With reds and oranges splashed against mountains, seasonal festivals, and slightly cool temperatures, autumn appears to be generally adored here, reminding me of the affection I had for the season growing up in the Midwest. Moreover, October had added importance this year: one of Korea’s biggest holidays, “Chuseok,” took place this month. For me, the month was also rounded out with Fulbright’s Fall Conference (one of a few opportunities to reunite with all the other ETAs), and a two day long school festival, with performances from all of my students. My host “grandparents'” honey farm in Wonju. Chuseok is one of Korea’s biggest holidays, dedicated (among other things) to the autumn harvest, family reunions, and to honoring ancestors. While three days in length, this year, the calendar aligned with another holiday, Hanguel Day, resulting in a 10 day long vacation. During Chuseok, the mostly urban population of Korea tends to migrate out of the cities to visit the small towns and villages from which their families came from. Early on in my stay in Hwacheon, I had agreed to spend most of Chuseok with my homestay family. Given that Chuseok is typically a family gathering, I was both surprised that they wanted someone relatively new in their lives to accompany them, and excited about the chance to experience Chuseok festivities first hand. With a longer vacation, the plan was to spend a portion of the week with both sides of my host parents’ families, and the remainder camping on the west coast. While I felt pretty comfortable with this plan at first, as we departed Hwacheon in our tightly packed minivan, I began to feel unsettled. The feeling stuck with me as we reached my host “grandparents’” house, a honey farm in the rural outskirts of Wonju. The car ride had tired me out, and I began to realize that I had not properly anticipated the extent that the absence of wifi or being entirely cut off from English the whole day would affect me. Unable to contact my family and friends at home while witnessing heartfelt reunions taking place around me, and disoriented from trying to keep up with conversations in Korean, the first few days of break came with my first real unexpected wave of homesickness. Additionally, once again I was a new foreigner around so many new people, which meant that there was a lot of focus directed at me. I spent hours trying to piece together parts of the conversation happening around me. When I became full after eating a meal or when I passed up on a snack, I could feel the uncertainty that lingered in the air, and overheard a few, “Does she not like Korean food?”’s much to my dismay. In the spirit of hospitality, I was inundated with questions about whether I was tired or bored several times every hour. Eager to please, I found myself attempting to contort my face into lively expressions and to outwardly project enjoyment of everything I ate to defer these comments. Concurrently, as I grew more aware of my frustration, I started to become annoyed with myself. I was truly being graciously treated as guest in this family vacation, and yet I was somehow letting myself feel unsettled? After the first few days though, the awkwardness subsided and everyone, including me, seemed to adjust to my presence. During downtime when the family was having personal conversations, I took to journaling, taking pictures, or spending time with the cute, young host cousins whose conversations I could somewhat keep up with. At the same time, I started to take in the holiday, helping with cooking and cleaning whenever I was allowed. The last morning of Chuseok, we drove up a neighboring mountain and visited the grave-sites of their family members. My host parents cleaned the stones and presented some food as an offering, and then we all ate together on the mountainside. We spent the rest of the evening exploring the village, an old miner’s town, and enjoying a barbecue dinner together. My host family’s extended family was warm and funny, and I felt so grateful to be included in such a close gathering. The last few days of the trip though, camping at Taeanhaean National Park, ended up being some of the best days of my time here so far. We arrived at a small patch of forest near the west coast beach, and the area was packed to the brim. Nearly every square inch of the park that wasn’t the road seemed to be occupied by a tent, car, or human. The scent and sizzling sounds of grilled meat filled the air, and large clusters of kids were outside sleeping, watching TV on their iPads, or chasing each other and throwing things at one another. At the end of every night, we would head out towards the coast together, where a few families were lighting fireworks on the sand. Dirt and pebbles poured into the green crocs my host family lent me, and the air smelled like fish. In the dark, there were about a hundred bright lights in the distance, reflecting in the water. At first, I attributed this to boats out in the harbor at night. As we approached the shore though, I realized that the lights were actually headlights worn by the nearly a hundred people that were knee deep in the water, digging for sea food. All around me, young and elderly people alike were wading around in the dark, eyes fixated on the movements of fish and crabs below. While I myself abstained from fishing for most of the trip, I spent a lot of time marveling at my host cousins plunging their fists into the shallow cold water to catch small sea creatures. By the trip’s end, those were the times I would miss the most. In addition to the holiday from Chuseok, the other ETAs and I were pulled out of school for a long weekend conference in Gyeongju, all the way at the southern end of Korea. Traveling to Gyeongju requires a lengthy and expensive commute from Hwacheon, so I was excited at the prospect of both reuniting with some friends, and seeing a part of Korea I might not have traveled to otherwise. The moment we arrived in Gyeongju, I was struck by how beautiful it was. The trees were much larger than in Gangwon, and towered above us in an array of colors in mid-afternoon warmth as we traveled to the hotel. I grew more and more excited to explore the area… until we promptly arrived in an overwhelming hotel lobby filled with our entire cohort chatting and catching up. I reminded myself that for the next 36 hours, the days were actually more or less filled with intense programing within the walls of this hotel. While the idea was tiring at first, the weekend actually ended up feeling rather refreshing. It was a welcome release to reconnect with the other ETAs and see the little things they had picked up over the past couple of months. It was especially interesting to speak to the renewees, since we never had the chance to get to know them during Orientation. The hours were filled with large and small group discussions led by fellow ETAs, shared meals, and lots of snacking on American treats. The day’s end came quickly, and I felt newly inspired by the energy of the other ETAs. Waiting in line at the Buddhist temple. Contrastingly, Sunday was dedicated almost entirely to touring the area, and we ended up packing quite a lot into our visit, including the Daereungwon​ tombs, Anapji pond, and the Bulguksa temple. We also had the chance to visit the Gyeongju National Museum, which mapped artifacts of Korea from prehistoric times to the Silla Dynasty. As the weekend came to a close, I was exhausted– catching up with such a large group and the extended traveling had caught up to me. Yet, I felt content, with a new wave of enthusiasm for the school week ahead, and a rekindled appreciation for the other members of the cohort and our shared experiences all across the country. While only my second full month of teaching, October had one of the most haphazard teaching schedules I will probably have to manage during my grant year. The holiday, my conference, a myriad of field trips, as well as a two day long school festival to finish out the month meant that a lot of time was dedicated to juggling schedules and rearranging classes. Sometimes, nearly my entire day was filled with classes with the exception of lunch, while on other days, classes requested to be moved or shortened at the very last minute to practice for the festival. Nevertheless, while school days were kept rather busy, I loved the change in atmosphere the festival brought with it. Lukewarm responses to classroom questions turned into animated attempts to shout out descriptions in English when I asked about the progress of their performances. More kids swarmed the English classroom during breaks, not just to beg for Maiju candy, but also to talk about their skits and dances, and to read short stories with us. The energy permeated throughout the entire school. Class teachers spent much of the day deciding their performances, and the children seemed to always be sharing jokes or laughing as they poured into the classroom. During lunch, even the quieter kids began to wave hello or stop by to greet the teachers while we ate. During the two days of the festival, Dana (the other ETA at my school) and I endlessly cheered for our kids and videotaped all of their performances. Several groups did dances– from adorable 3rd graders doing folk dances to a hilarious K-pop medley by the 6th grade–, one group played the recorder, and a few did skits. Songs from the”Queen” and the “Pirates of the Caribbean” soundtrack were frequent background tracks. Additionally, there were a few special performances: the gymnastics team, an amazing and sweet group of 4th graders backflipping around stage, and the bellydancing team, which meets for class every week from a visiting instructor. Dana and I also made a fun cameo in one of the performances– a fourth grade class decided to do a rendition of Eidelweiss from Sound of Music to represent “American culture”, and asked us to be special guests. The other students collectively gasped and cheered when we got on stage (although to my dismay, my host brother later told me he found my individual performance to be lackluster), and we ended up having a lot of fun with the students in that class. Both days, it was so fun to see my students being silly and strange and bold and happy, during and outside of their performances. My face actually hurt from smiling at the end the week, and I really felt how large my students had come to loom in my heart. Cutest guitar trio the world has ever seen. In a month of many important occasions and travels, I found that there were also so many smaller moments in day to day life that had made an impact on me as well, which I will address in Part 2 of this post. October ultimately became a month of community for me, a time when I really went all in with my school, my cohort, and my host family. And in that light, I realized how fortunate I was to have the communities in Korea that I do, and how much they have shaped this year in a positive way for me. On the other hand, a small part of me worries about the stability of these groups going forward. Will traveling during winter break lessen the bond I’ve come to form with my host family? Will the upcoming graduation of my 6th graders change the dynamic I’ve come to understand in my classes? I try to reassure myself though, and focus on what I have. So far at least, returning to school every Monday and seeing my students eagerly wave to me has felt like coming back to something familiar and warm. And the bus rides back into Hwacheon from travels afar have only felt more and more like returning home. The last Thursday evening of Orientation, I spent 30 minutes haphazardly compressing every item I had brought with me to Korea, and every new item I had received since, into my bags. The next Friday morning, I stood side by side with my friends at our placement ceremony, catching a short glimpse of my future co-teacher when my school was announced. And by Friday afternoon, I found myself in that very same co-teacher’s car, northbound to Hwacheon, and farther and farther from most of the people I had come to know since arriving in Korea. Once we reached Hwacheon, I was surprised at the lack of nervous energy I felt. When we pulled up to the apartment that I would soon be living in (which, I have since realized, seems to house a good proportion of Hwacheon’s population), my host brother and host mom stood outside waving me in. They gave me a smile and helped me pull my luggage into the elevator, my 12 year old host brother eagerly telling me about the family’s recent trip to Universal Studios in Japan and the Harry Potter wand he had begged his mother to buy. I stepped into the apartment to find the entrance decorated with a few balloons and a poster labeled, “Paavani Reddy! Welcome to my house!” My heart warmed a little bit, and emotion filled me to my fingertips– an unexpected wave of relief and optimism. This town, and this apartment would be my home for the next year, and these would be some of the people I would get to know most of all. I felt fortunate, and I felt ready. Probably the loveliest commute I will have: a bridge crossing the Bukhan river and overlooking the mountains near Hwacheon. Admittedly, when I first looked into the population of Hwacheon, I imagined a sparsely populated town with one or two shops and a small school with a few classrooms. To be fair, Hwacheon is a relatively small place, but it packs in quite a lot into its small area. Along the main street alone, there’s a traditional market, a few french themed bakeries, a handful of make-up stores, and many, many restaurants and coffee shops. It wasn’t until I stepped into Hwacheon Elementary School though, that I realized how much I had really underestimated Hwacheon. The school is quite large, with three floors, but also well-maintained. Near the cafeteria, there is a celebratory display of the upcoming PyeongChang Olympics games. The English classroom, where I both teach and spend my lesson planning time, has a small English library and a collection of games and activities for the kids, as well as a large smart board. Many of the other classrooms in the school have their own small TV’s in the corner. Colorful paintings and plastic shoe racks line the building walls. Science Day in Hwacheon Elementary! This group got to play with/learn about Virtual Reality in the new science room. As far as actual classes go, I have anywhere from 3 to 6 classes per day, usually in the earlier half of the day, rounding out my week with 22 teaching hours. My placement is rather unique in that another ETA, Dana, is also working at my school. As a result, we divide the grade levels (Dana teaches 3rd and 4th, while I teach 5th and 6th), but end up teaching these classes many times a week. Thus, our non-teaching hours in the English room with our co-teachers end up getting filled very quickly with lesson planning and erratic conversations with our students. Occasionally though, Dana and I have gotten to explore the town and run errands during our breaks. Despite the quick pace of work, I genuinely appreciate the setup of my job. During the earlier part of the day, I teach my fifth and sixth grade classes with my co-teacher, dividing the workload. My co-teacher is extremely patient with students in the classroom, eager to give me helpful feedback on lessons, and enthusiastic and open to any and all ideas about engaging the class. She really, really likes incorporating music into our lessons (songs so far have included: Seasons of Love, Paradise, and Sunny, an American song from the 70’s that is astonishingly popular in Korea due to being featured heavily in a recent Korean movie of the same name). Despite our age difference, she treats me respectfully, and has made the first month of teaching a lot smoother than it might have been otherwise. During the latter half of the day, we have after school lessons, which we teach without a co-teacher. These classes have less students overall, and are a fun opportunity to try out our own ideas since there is no textbook, although they require a little more planning. Specifically, I have begun to realize how much foresight I need when it comes to translating class instructions and activities into Korean beforehand. In my fifth grade class, I’ve been working through a “Language through the Arts” theme, since many of my students enjoy music and dancing and plays (and I do too)! Outside of this, there are a few other interesting additions to the week. On Wednesdays, my co-teacher offers Minhwa (traditional Korean painting) lessons, where I have begun to learn that I am a really slow painter. Additionally, as an insight into how English-speaking foreigners may be perceived, Dana and I have also been assigned to teach a preparatory class for a few of the students in Hwacheon Elementary school who have been selected for a “study abroad” immersion opportunity in New Zealand… despite the fact that neither Dana nor I have been to New Zealand. Besides the class load, the most difficult aspect of my work here has probably been the wide range in levels, not only from class to class, but within a given classroom as well. While conducting interviews for students to attend the New Zealand program, some children spoke near-fluent English, and even discussed surprisingly lengthy English novels that they had read. On the other hand, I have many classes where a majority of the students are struggling to read. In some of the hardest lessons, students who cannot follow along get extremely distracted and start talking, moving around, or physically poking/play-hitting their peers. In these classrooms, maintaining consistent classroom management has been important, but difficult to enforce at times. While there are a variety of reasons for these discrepancies, I think part of it could be attributed to the small nature of the town, combined with the recent influx of many hagwons ***, after school English classes, to the area, as well as the fact that the school itself is rather well funded. Many of the families in Hwacheon are soldiers, local business owners, and farmers. Some, as my co-teacher explained, live demanding and busy lives at home– English, and school in general, are just not that high of a priority. Others, however, have been rigorously attending Hagwons from a young age, or come from families that moved to Hwacheon particularly for the strength of the school’s teaching program. This creates an uneven and often challenging class dynamic, and every day I am trying to become better equipped at dividing up the lessons to offer more room for growth at individual levels. Wishing lanterns in Cheongpyeongsa temple in Gangwon. I started writing this entry, partially because I realized so much time and so many experiences had passed since last updating this page. But I was also prompted by the realization, at the end of last week, that I was starting to get into a good flow with my days here, both as a teacher, and at home. I had successful classes and felt wonderfully elated. But I could also better see where things had gone wrong in difficult classes and make adjustments during the day. While I of course have much room for improvement, the feeling of being overwhelmed has made way for the feeling of being challenged. My first month here has been, appropriately, getting adjusted to the routine of life here: navigating my work life, gathering a sense of the people and places that make up this town, and figuring out how to carve out much needed time for myself. I’ve picked up a lot of phrases, learned about Korean and local traditions, and made a very, very long list of my favorite foods. While this process will continue, I have also begun the process of looking for other ways to learn bit more about Korea and actively work on cultural exchange, including hopefully, a pen pal program, some arts classes (Hwacheon unfortunately does not have dance classes), and traveling across more of Korea in the future. Now that I have a better sense of the place I will be living in, I have a stronger sense of what I can feasibly accomplish while here. My heart has already grown strongly towards Hwacheon, and something I’ve been thinking about more recently is how truly glad I am that I get an entire year here. Being in Hwacheon is a unique opportunity to see and learn outside of the highly urbanized Korea that we most often hear about. It gives an interesting insight into how modernity and rural life exist hand in hand in such a small country, and the complexities that emerge in these smaller, yet deeply important parts of Korea. During college, I often felt as if many experiences took place through rapid acceleration and deceleration. Classes rushed by in a period of nine weeks, extracurriculars and work would build up quickly and then suddenly be finished. It was as thrilling as it could be exhausting. One quarter to the next, one class to the next, one job to the next, one country to the next. While I feel thankful for every opportunity that has given me, I also feel relief in having something different here. I have a lot I want to get done this next year as well, and a year is by no means a long amount of time, just simply longer. As I grow more at home here, I’m excited for the stretch of time ahead of me, for more opportunities to learn and be uncomfortable and improve in the things I do here. Equally so, I feel happy with the familiarity and routine that come with life in one place, and for the view of the mountains over the Bukhan river every morning. *Naver Papago Translate is a popular translation app in Korea. It is interesting to see a language app geared towards Korean speakers: besides French, English, and Spanish, the remainder of the languages are from East Asia or South East Asia. **Another way Hwacheon has grown familiar to me: a brief glimpse into Hwacheon’s Wikipedia page will tell you that there is a sizable military population in the area, and I’m surprised how normal it’s become to see a good portion of the town in uniform. It’s not uncommon to see streets and restaurants and busses filled with soldiers and their friends, or hand in hand with their girlfriends. ***A popular translation of hagwon in Korea is “Academy,” although this connotes something slightly different than the private after school programs that make up hagwons. While many of my students are in English hagwons, some of them take classes oriented towards other subjects, or to help them catch up with work. Still others are oriented towards the university entrance exam students have to take. I will definitely be discussing hagwons more in a future post! “Tara haseyo– repeat after me!” our teacher exclaims in a loud, clear voice. In room 605, the twelve of us are arranged in a semicircle, name tags labeling assigned seats for the first time in years (mine reads 파바니, the hangul spelling of my name). Our teacher reads off the vocabulary words she’s handed us for the day, and we echo them back in strained accents and shaky voices. 8:00pm – onwards: Free time to study, explore, relax, sleep etc. For the first few days, heavy from jet-lag and the summer humidity, dragging myself through this schedule was a painful endeavor; nearly all of my conscious effort was channeled towards staying awake. Over time though, we’ve calibrated. Our collective group energy drifts in and out: there are days when 5 hours of Korean class feels like 5 hours of Korean class, but there are have also been many hours where the time fills with fun moments of sharing snacks , joking with our teacher, and getting to know each other through games and travel and TV. An attempt at making tteok-bokki (one of my favorite foods here so far) during cooking class. Taken at the middle school I visited as a part of a site visit. It’s hard to see because of my poor photography skills, but “Teacher” was covered in the most stickers by far. Jungwon University– where Orientation is taking place. Nicknamed “the marble maze,” Jungwon was partially built to sustain resort-like activities. As such, during my time on campus I’ve seen their museum and botanical gardens, and gotten glimpses of a beauty salon, spa, and water park. Taken alongside a Buddhist temple in Sokcho– each stack corresponds to someone’s wish. The dorm rooms, bonding activities, and long days spent together elicit the feeling of a summer camp. It took a few days to build enthusiasm (and endurance) for the set up, but knowing that perhaps this will be the last time I am a “camper”, I’ve been able to put my heart into it and the levity that comes with it. More importantly, everything feels extremely purposeful here in the context of our grant year at large, something I’ve found motivating during the most tiring days. For instance, while Korean class feels quite intensive, it’s undeniably an incredible opportunity. I’ve found that the weight of what we do in class is lessened by the practical skills I’ve already gained. My second week here, I felt absurdly elated and proud after a simple successful interaction at the convenient store completely in Korean. “I did it! I made sense!” I exclaimed eagerly to a friend, the cashier giving us a patient smile for our small victory. One of my largest worries going forward with teaching is being hindered in my interactions with students and coworkers due to language. While I’ve still got a long way to go, I am excited (and grateful) to have already come this far in a few weeks. There are other aspects of Orientation I’ve slowly come to appreciate as well. We have had a few opportunities to take classes in martial arts, cooking, and k-pop dancing. We’ve gotten to hear from past ETAs about their experiences in Korea. We helped with a summer English immersion camp, giving us the opportunity to practice teaching and forming bonds with students. We have gotten a real, lengthy opportunity to get to know one another before embarking onwards to our separate destinations. I’ve felt surprisingly secure here already, even while being aware of the uncertainty that lies ahead. I think a lot of that is owed to us having this chance to slowly get a sense of life here before diving head first into the year ahead. Regarding the year ahead, perhaps the most important update to share is that I’ve finally received my placement. In a few weeks, I will be leaving to teach at an elementary school in Hwacheon, a small rural town in the Northern Gangwon province. Hwacheon is in a very mountainous area, occasionally broken apart by the riverbeds, and is located several miles away from the DMZ. It’s known for its natural beauty and has a huge ice-fishing festival that brings in crowds of visitors during the winters. My initial worries about the placement were mostly due to our distance from other ETAs, who seem to be centered more southwards. Nevertheless, I feel fortunate that there will be several other ETAs within the Hwacheon area– there is not only another ETA at my elementary school, but one at the nearby middle school as well. I was especially excited after contacting the previous teachers from the area and learning that they had had really positive experiences there. I’m excited to explore traditional small town Korea, and work with students who may not have as many resources as students in the academies in larger Korean cities. Between hiking and exploring the outdoors and Hwacheon’s close proximity to fairly large cities (Chuncheon, 50 minutes away and Seoul, an hour and a half away), I feel flexible in how I can use my time as well, a fact that is liberating in and of itself. Coming into this grant year, Orientation had always been an exciting prospect, but more so from a practical standpoint, the prologue to the year ahead. In particular, I was grateful for the opportunity to learn Korean before teaching, and looked forward to meeting a few people before heading off in our separate directions. I truly have been surprised by the enjoyable and rewarding moments that have snuck up on me these past few weeks. Still, Orientation has been much more comfortable than our lives as teachers will be. Beyond having a lot of our amenities, schedule, and travel cared for, we have been interacting with a relatively large American cohort. But we’ve also been pushed to learn a lot these past few weeks, through language classes, organized visits to museums and sites, and outside lectures and experiences. Although I’m eager for work-life to commence, I’ve begun to realize the corresponding loss in social and educational opportunities that will come with that transition. Teaching, adjusting socially, and properly acclimating to a new place will require a lot from us. The limited free hours of the day and access to resources during the year could easily mean that pursuing learning and engagement opportunities will require a lot of effort on our part, and difficult to access in general. Still, it’s natural to want to get as much as we can out of our time here, and the past few weeks have been a reminder of that. I want to continue to explore personally and take individual initiative to learn about Korea’s history, its struggles, and its triumphs during my time here. Orientation has been a regimented marathon of guided personal reflection and cultural learning. Once we break off into our respective locations, I hope to embark on a less tiring regimen, but one that is also more directed towards my own interests. Perhaps that will mean independently studying Korean, or seeking out literature on Korea’s past on my own, or finding a dance class. It could even mean taking a break from my day to explore and appreciate the region that will soon be my home. Whatever form my learning this year takes, I will be my own guide. Above all else, I hope this post will hold me accountable to the desire to be just that. During one of my childhood visits to India, my great-aunt, a retired Telugu professor, sat me down and had me trace a few dots she had drawn on a paper to create a looped structure. “There you go, your first letter in Telugu,” she said, and looking at the once meaningless character, I felt a surge of pride. Over the course of that entire summer I learned Telugu script and reading, and in an almost magical way, the ordinary signs and books I passed suddenly carried a new meaning and life. I felt aware of an entire new dimension to the Hyderabad that I had visited so many times before, the simple perception of meaning in the words breathing life into familiar corners of the city. Overtime, this story has grown in importance to me. The memory stuck with me when I first thought about teaching in Korea this next year, and resurfaced again when I received the opportunity to do so. Over the next thirteen months, I will be living in South Korea (occasionally nicknamed “the land of morning calm”) as a part of the Fulbright ETA, English Teaching Assistant, program. After a six-week orientation program at Jungwon University, I will be sent off to my soon-to-be-revealed placement within Korea, where I will then (as the program name suggests) work as an English teacher and develop my relationship with my school and homestay family for the remainder of the grant period. How does teaching English fit into this mission? At first glance, an ETA could potentially be perceived as a one-sided effort focused on English and American culture (possibly something to discuss in a future post). But while we are encouraged to share our insights into American culture during our time abroad, what most interested me in the program was the large emphasis that Fulbright places in grantees engaging deeply with their host country, forging connections with the students in our classroom, with our co-teachers, and with the people we meet in our daily life. I feel extremely fortunate to be given this opportunity, but also nervous about making the most of my limited time in Korea. Outside of the classroom, there are so many aspects of Korean culture, specifically their arts and their healthcare system, that I’m keen on exploring. I’m also acutely aware of the general sense of worried anticipation that precedes a new experience. Will I mesh well with my placement? Will I get along with my host family? This will be the longest I’ve been away from home, and the thirteen-hour time difference, coupled with graduation, makes the distance seem somehow farther than it already is. For the time being at least, I am trying distance myself from these expectations and worries about the year. Getting used to a new setting of any kind, especially while abroad, requires a sense of surrender and acceptance at the beginning, as we adjust to different schedules, different people, different rhythms of life. Until my school placement, homestay family, and location are decided, it will be difficult to set any preconceived notions at all about the year. For now, I’ll just have to (at least try to) trust that the work I have and will put into improving my teaching skills and learning about Korea will come to fruition. While I was initially unsure about whether or not to blog my time abroad (mainly based off of my worries about being able to keep this up), a few conversations with friends and family members convinced me it might be worth a try. In order to make sure that I do keep posting during the year I will probably post infrequently, but to make up for it I will try my best to be thoughtful about what I do post. Besides using this as a way to personally reflect from time to time, I mostly want to share my experiences as realistically as possible– from tiny victories and struggles I may find in the classroom, to intriguing aspects of Korean society I find myself drawn to learning more about. I also think that blogging is a small way of doing my part to help spread what I learn about Korea to friends and family, just as I will be sharing my experiences in America with my students during my grant period. There have been so many small moments of preparation for this year, that it’s difficult to believe the time has finally come for me to leave. What started with a careful navigation of the visa process, criminal background check, and tax forms required for teaching has ended with me finally completing my TESOL course over the course of several late nights. There was the elation of finally learning Hangeul (the Korean alphabet), and the bittersweet goodbyes with friends and family before leaving. Thinking back to when I first learned how to write Telugu, I feel optimistic as I leave for Korea– excited to relive the process of learning about another place and culture, and enthusiastic about helping students of my own experience this as they learn English. *The Fulbright Program is potentially facing significant cuts by the current administration, despite the significance it has played in cross-cultural understanding between the United States and the rest of the world for many decades. Learn more/take action here.